A new most handy program that splits multi-page TIFF files into separate images. TIFF Splitter is easy-to-use and has transparent interface. TIFF Splitter has two 2 ways of handling: you may either use the command line or user interface. 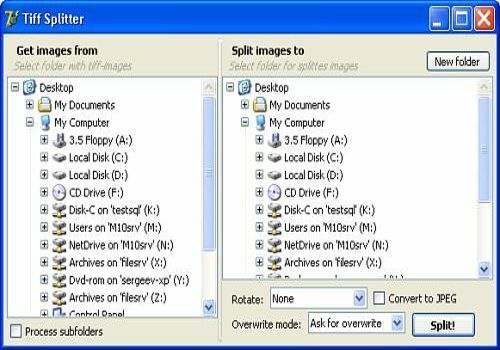 Select the folder where you have your tiff files and the directory you want to place output files and press the button "Split". TIFF Splitter will do the rest for you! Tiff Teller provides you with all the information about TIFF and PDF files. It will tell you the number of pages, width, height, file type, file path, file size. Divides multi-page invoices according to your needs. You can divide TIFF files by date, invoice number, address or any other symbol. Tilt Shift Generator recreates the tilt-shift effect without using a real tilt-shift lens, allowing you to reproduce the appearance of a miniature scale model post using your PC. To easily assemble TIFF files into a TIFF file. TiffCombine is easy to use with its interface. Once set up, a few mouse clicks will suffice.